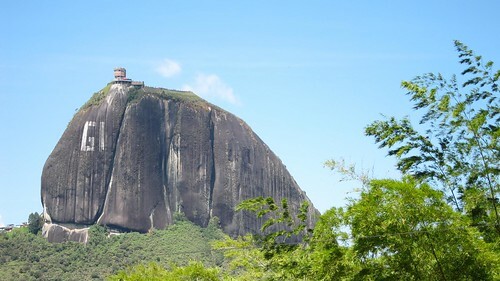 El Penol – at one point, there was an effort to paint “Guatape” across the face of the monolith. During my weekend getaway to Guatape, a small lakeside pueblo a few hours east of Medellin, Colombia, I also visited a popular landmark called El Penol. Pitstop to refuel the tuk-tuk we took from Guatape to El Penol. 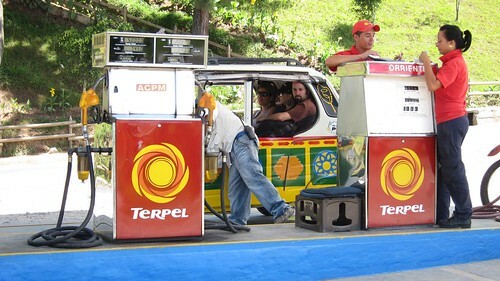 We hired a tuk-tuk, which zipped as quickly as it could from one pueblo to the next, however knowing how Colombian buses are driven, I felt a little uneasy every time we entered a sharp turn. A winding staircase leads up the rock face. The 220-meter tall monolith begs to be tackled by visitors young and old. 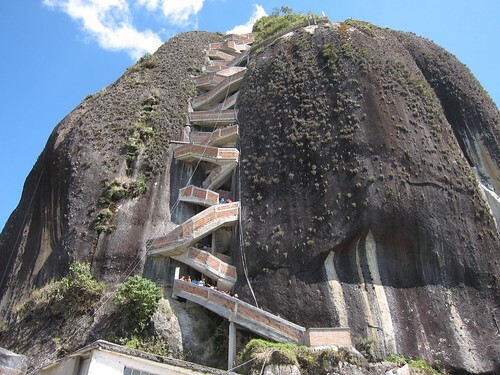 While we were there, climbers were taking the adventurous route up the rock face, while myself, Troy, and the regular parade of Colombian and international tourists climbed the 600+ stairs which were ensconced in a large crack. 360-degree views of the surrounding lakes and hills reward those who climb the monolith. Once I reached the top of the rock, I knew why so many Colombians had recommended I make the day trip from Medellin to visit. 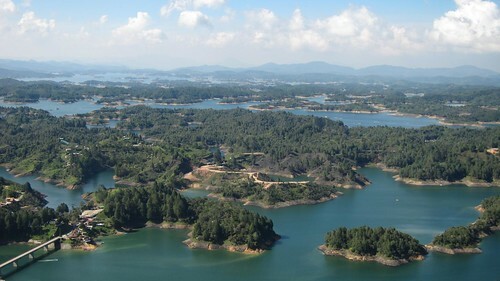 The landscape of rolling green hills, surrounded by the blue waters of the artificial lake, were picture-perfect. 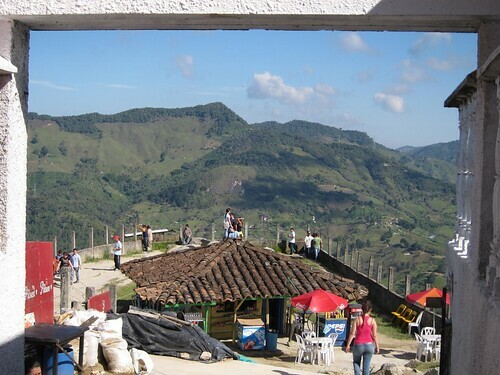 Atop El Penol are several small tiendas where visitors can rest and enjoy the views with a drink or ice cream. I remember visiting here. I was REALLY sick and it was my first day outside after a week of puking and shitting. Ohhh… fun times. Gotta love Colombia! Giving a blog talk to beginner bloggers in the not-too-distant future, I’ll be pointing people in the direction of your efforts. Nicely put together dude.